Stunning azure hues flow through this modern, monochromatic arrangement. It’s perfect to celebrate your favorite guy, or a new baby boy, in exquisite style. 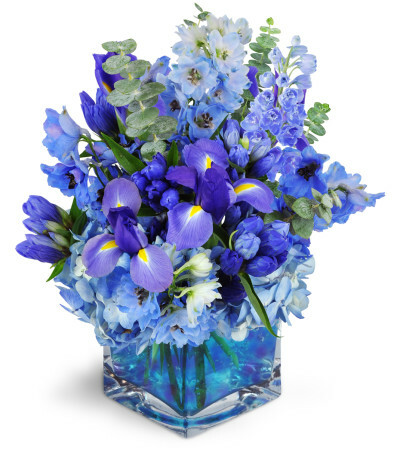 Delphinium, iris, balloon flowers, and more are arranged in delightful shades of blue, complete with a blue-tinted cube vase. Extremely happy with entire process! 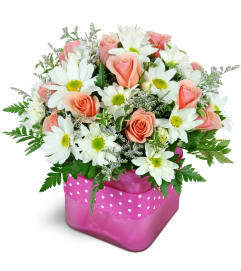 Easy to order on line & confirmation given when delivered. Flower arrangement was stunning! Full! Lush! Fresh! I definitely recommend & will order again! 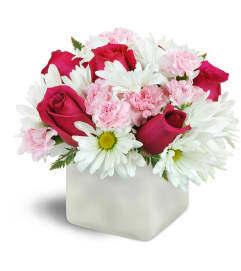 Chasing Petals is a Lovingly Florist in Barrie. Buying local matters. Discover how Lovingly supports local florists. Copyrighted images herein are used with permission by Chasing Petals.